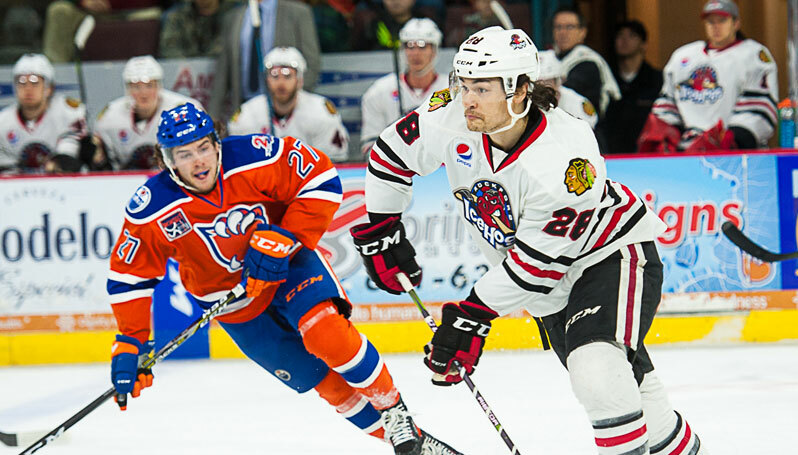 BAKERSFIELD, Calif – Ty Rattie scored midway through the third period to force overtime and potted the game-winning strike with just 24 seconds remaining in the extra frame to help the Bakersfield Condors notch a 3-2 come-from-behind win over the Rockford IceHogs Saturday night at Rabobank Arena. Despite the setback, the IceHogs extended their point streak to five straight games (3-0-1-1) and concluded their three-game, California road trip with five of six possible points. Rattie converted on a breakaway in the final seconds of overtime by beating Matt Tomkins low, glove-side for the game-winning goal. The forward also scored on a feed from Joey LaLeggia 13:03 into the third period to tie Bakersfield with Rockford 2-2 and send the contest into overtime. Grayson Downing also scored for the Condors, lighting the lamp for the first goal of the game at 9:05 in the opening period as part of his game-high three points. Tyler Sikura and Carl Dahlstrom then scored within 43 seconds of each other in the second period to give Rockford a 2-1 lead. Sikura extended his goal streak to five straight games with a highlight-reel effort in which he dove from below the goal line, and while still in mid-air, batted a loose puck into the net for his 11th tally of the season. Sikura now owns the longest active goal streak in the AHL and is just one game shy of matching the league’s overall longest goal streak of the 2017-18 season. Dahlstrom followed with a flicked wristshot that gave the IceHogs a 2-1 lead at 15:00 in the second period. Tomkins finished with 32 saves to earn a point for his second straight start. His counterpart, Laurent Brossoit, stopped a season-high 38 pucks to earn the win for Bakersfield.